The Dota 2 Asia Championships 2018 are just around the corner and it's all about valuable Dota Pro Circuit points in the run-up to The International 2018. With Team Liquid, Evil Geniuses, Team Secret, Newbee, Virtus Pro and the recently very successful VGJ. Thunder all top organizations are represented. Besides the impressive prize money there are 1500 Dota Pro Circuit points which are urgently needed by teams like OG, Mineski, TNC and LGD to pursue the dream of the Dota 2 TI 8. After OpTic Gaming won the North American qualification, compLexity gaming, the arch-rivals from North America, made a big decision. Kyle “Swindlemelonzz” Freedman, the longtime team captain, ends his career at compLexity gaming after 4 successful years. The Dota 2 Asia Championship 2018 is another major tournament and is therefore one of the great tournaments that will become all the more important for the teams as the TI8 approaches. In the meantime, the Dota Pro Circuit Points still to be won are disappearing. That means once again a Dota 2 event of superlatives awaits us, and all fans can join in the excitement with their favourite teams. 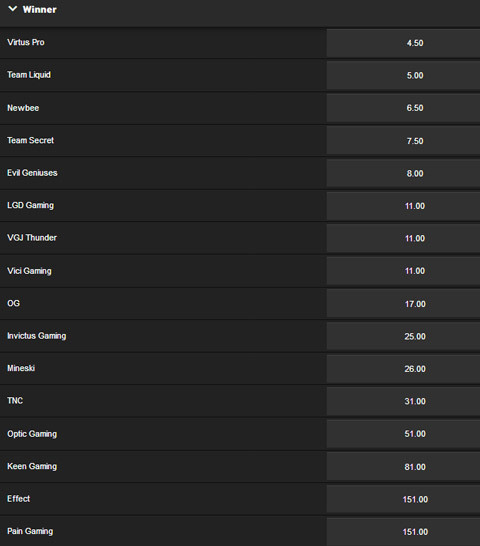 Of course the bookmakers will not let it slip to also again publish bets and odds for Dota 2. So you can bet on your team again and follow their games with high tension. Please notice! Dota 2 betting odds shown might have changed in the meantime. Follow the links to take a look at the current betting odds. In DAC 2018 the 16 teams will first be divided into 2 groups, in these groups everyone will play against everyone in the so-called Round Robin phase. The 2 top teams of the groups will go directly to the playoffs of the main event, while the 2 last teams are already out of the competition. All the others, a total of 8 teams, will enter the so-called breakout phase. Here teams meet in a best-of-three decision, the winner is allowed into the playoffs, the loser has to pack his bags. Here again 8 teams remain in the tournament, which changes in this phase in a double elimination mode. This means that a team is still in the tournament after a defeat and still has the chance to take home the title, the Preigseld and the much sought-after Dota 2 Pro Circuit Points. The Grand Final will be held in the Best-of-Five. Esport betting is likely to be offered for each phase of the tournament. There are two livestreams available!